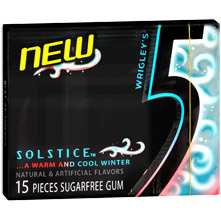 This gum is marketed as having a “warm and cool winter” flavor. As a result, I was expecting some sort of fascinating cinnamon and mint combination; instead, I just got what tasted like a hybrid of two types of mint. It’s difficult to discern, but I think the flavor is spearmint and wintergreen. This combo made for a distracting mint competition in my mouth. To make things worse, all of the wrappers in my package had an unsettlingly sticky feel. This confused gum should pick one side of the mint fence or pioneer with an innovative flavor. It does neither. This entry was posted in Food & Drink and tagged 5, Gum, Solstice, Wrigley. Bookmark the permalink.